Dark mode plasma phenomena exist on the Sun. 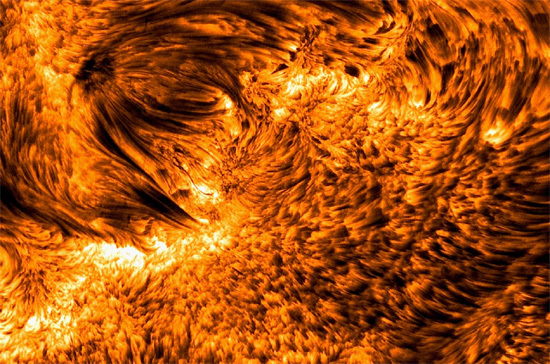 The image at the top of the page is the most detailed ever taken of the Sun’s chromosphere. The smallest features are 130 kilometers in size. Each spicule is about 480 kilometers in diameter, with a length of 3200 kilometers. The largest measure as much as 8000 kilometers long. Although the light and dark regions are colorful, the colors were added in processing. In the electric Sun hypothesis, the Sun is a glowing anode, or positively charged “electrode.” The cathode is an invisible “virtual cathode,” called the heliosphere. The heliosphere is at the farthest limit of the Sun’s coronal discharge, billions of kilometers from its surface, where a “double layer” isolates the Sun’s plasma cell from the galactic plasma that surrounds it. Galactic plasma is otherwise called the Interstellar Medium (ISM). Electric forces occurring within the double charge layer above the Sun’s surface are responsible for the incredibly active plasma phenomena that we see. Since Electric Universe theory assumes that celestial bodies interact through conductive plasma and are connected by circuits, the Sun is also assumed to be electrically connected with the galaxy. The Sun can be thought of as an electrically charged object seeking equilibrium with its environment. However, it is not stable. The charges flowing into and out of the Sun can sometimes increase to the point where it releases plasma discharges called solar flares. Conventional scientists see solar flares, or coronal mass ejections (CME), taking place when magnetic loops “reconnect” with each other, causing a short circuit. The so-called “magnetic energy” is said to accelerate gases into space. Although “magnetic reconnection” is a poorly constructed theory, it is the only explanation offered by heliophysicists. The “solar wind” is a dark mode emission radiating from the Sun at approximately 700 kilometers per second. In a Universe governed by gravity, the Sun’s heat and radiation pressure cannot explain how the charged particles that make up the solar wind accelerate past Venus, Earth and the rest of the planets. Prior to the discovery, no one expected such acceleration. In an Electric Universe, there is an obvious explanation: electric fields in space. Since coherent charges flow through the Solar System, then it seems reasonable to conclude that the dark mode solar plasma is affected by the electrodynamic fields of the Sun and its planetary family. Solar flares could be tremendous lightning bursts in that case, pushing plasma to near relativistic speeds. If the circuit that connects the Sun with the Milky Way extends for hundreds of thousands of light-years, massive amounts of electrical energy might be contained in such magnetically confined “transmission lines” feeding the solar anode. According to the Electric Sun theory, flares, the hot corona, and all other solar phenomena result from changes in the electrical input from our galaxy. Birkeland current filaments slowly rotate past the Solar System, supplying more or less power to the Sun as they go. Arc mode, glow mode, and dark mode discharges are all influenced by those flowing currents of electric charge.